The Digital Technologies Curriculum is anchored in computational thinking, real world problem solving and design. 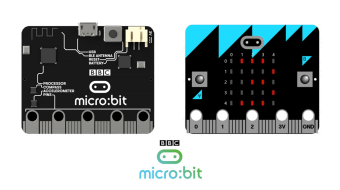 The ultimate tool that brings all of these concepts together is the BBC micro:bit, a programmable standalone computer that is smaller than a credit card and comes with sensors as well as connectivity. In this workshop you will learn the basics of programming the BBC micro:bit with both block code and Python and then apply these basics to several open ended projects. At the end you will go home with a semester’s worth (several hundred pages) of micro:bit project based curriculum that you can do with your students. In this session we will broadly cover the concept of physical computing and see where it fits in the Digital Technologies Curriculum. We will learn about the features of the BBC micro:bit and we will also touch on other technologies that teachers successfully use in the secondary classroom. In this session we learn the basic python micro:bit commands and we apply them to a program that will measure reaction time in milliseconds. We then tackle a number of tinker challenges one of which is to compare how fast humans can make a decision as opposed to just react to a light. Teachers need to bring a laptop with a charger. Good for approach. Very knowledgeable. Very good, although some parts were rushed and it would be good to go over the fundamentals and basic knowledge, there was a lot of assumed prior knowledge. The content was very good. Probably need more than one day to get around it. Very useful. Clear well communicated. Good pace – step by step. Excellent resources!!! The course was well taught. However, I would advise to cover some aspects of syllabus and how it may relate to it. I would love to have copies of the A/V presentation emailed.